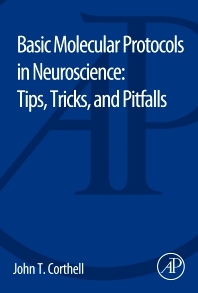 Basic Neuroscience Protocols: Tips, Tricks, and Pitfalls contains explanatory sections that describe the techniques and what each technique really tells the researcher on a scientific level. These explanations describe relevant controls, troubleshooting, and reaction components for some of the most widely used neuroscience protocols that remain difficult for many neuroscientists to implement successfully. Having this additional information will help researchers ensure that their experiments work the first time, and will also minimize the time spent working on a technique only to discover that the problem was them, and not their materials. Graduate and undergraduate students in biological and biomedical sciences, post-doctoral students and fellows, as well as all researchers seeking a practical resource on neurobiological methods. Dr. Corthell received a PhD in Neuroscience from Florida State University, where he studied circadian rhythms using whole-cell patch-clamp electrophysiology, as well as numerous molecular biology techniques, in the olfactory system. He has more than 10 years of experience in laboratory work and techniques in the biological and chemical sciences, and more than 5 years teaching. The author has cultivated these techniques over the years through reading, asking questions, and trial and error. Each of these techniques has been tested, performed, and in some cases optimized by the author himself. He enjoys reading, writing, learning, children, and big dogs. When not working, he longs to go SCUBA diving.